The Benefits of Roller Skating For Women are proven. As with any form of physical motion, roller skating burns calories and allows you to improve/maintain your physique. Unlike running or aerobics though, roller skating requires investment in a pair of roller skates for women and usually, a skating rink as well. Further, skating requires a modicum of training. Therefore, many people believe that rollerskating is a costly and somewhat complex regimen to follow. While it is true that a pair of skates and a rink would be needed, many people make do with rented skates before buying their own and/or use their courtyards or driveways for practice. Once you do surmount these minor obstacles and begin skating, you’ll find that it offers many advantages that running or other basic workouts don’t. Improves leg strength – Like running, roller skating for women improves the ability of the leg muscles to work harder and faster for longer periods of time. This is vital for those who wish to train for athletics and cycling events but do not find the conditions conducive to outdoor training throughout the year. Little joint impact – Running causes the joints to suffer from repeated impacts. While our joints were made for this type of wear and tear, many people suffer from conditions like arthritis that make such impact undesirable. Roller skating involves a gentle and fluid motion with the legs moving slowly even as momentum is maintained. This minimizes the impact on the joints and allows those with medical conditions to build muscle strength and physical fitness. Many people choose rollerskating / rollerblading for fitness. In fact, as a University of Massachusetts study found, skating tends to have 50% less impact on the joints compared to hectic exercises like running. Improves body balance and core steadiness – Since the body is on wheels, its centre of gravity is higher than when it is running. Hence, it is vital that the core of the body (the spinal cord and surrounding torso) remains upright and steady even as the limbs move. Developing this steadiness improves body posture and can correct weight imbalances between the two sides of the body. Enhances Coordination – Every variant of skating, be it the humble outdoor skating or highly competitive figure skating, coordination is vital since the movement of arms and legs and the shifting of the weight of the body decide whether you would execute a graceful sweep or fall flat on your face. Such coordination helps people excel in other activities like cycling, boating, dancing, etc. Endurance is improved – Since the muscles are constantly in use without being forced into sudden erratic motions, their endurance is improved. By endurance, we mean that the muscles can use the body’s energy stores in a more effective manner in order to provide support for longer and more gruelling training sessions including but not limited to, running, biking and swimming. Coupled with improved muscle strength, such endurance improvement allows you to move to more complex and demanding forms of workout should you wish to do so. Cardiovascular benefits – In a study published by the University Konstanx, analysts found that fast skating takes the heart rate to 180 bpm while slower skating keeps the heart rate between 140 and 160 bpm. Such high bpm, when maintained without any sudden spikes, can strengthen the heart rate significantly and this, in turn, can improve blood circulation to the muscles. 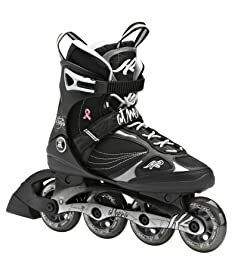 While it is not possible to enumerate in detail all the benefits of roller skating to be had when one buys roller skates for women and heads into the street/rink, the above should give you a fair idea of the superiority of skating over running and other basic workouts. Coupled with the fact that the best roller skates are often capable of providing stellar service over years, you can expect to enjoy these benefits for years with a one-time investment (and periodic maintenance). If you’re more ambitious, you could take up roller derby or figure skating and achieve renown and financial assistance while keeping yourself in top shape. 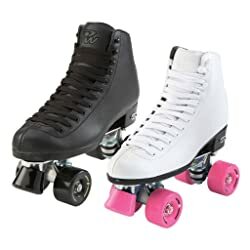 All of this considered, it is not difficult to say that as far as workouts involving the limbs are concerned, roller skates is definitely one of the best available for women regardless of your age.